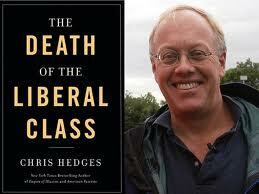 Chris Hedges, telling the truth about our current political, economic, and moral predicament. The picture when he connects the dots is devastating, but essential to understand if we are to begin to think clearly and outside of the conceptual boundaries set by the corporate state. Watch this! It’s about 45 minutes long. Less than an hour to cleanse your view of delusions foisted on us by a 24/7 propaganda machine.